Toronto, April 3: The World Trade Organisation has cited “strong headwinds” to cut back global trade growth projections for this year to 2.6% from the earlier predictions of 3.7%. The WTO said a slowdown in the major economies and financial volatility has triggered a slowdown in global trade. 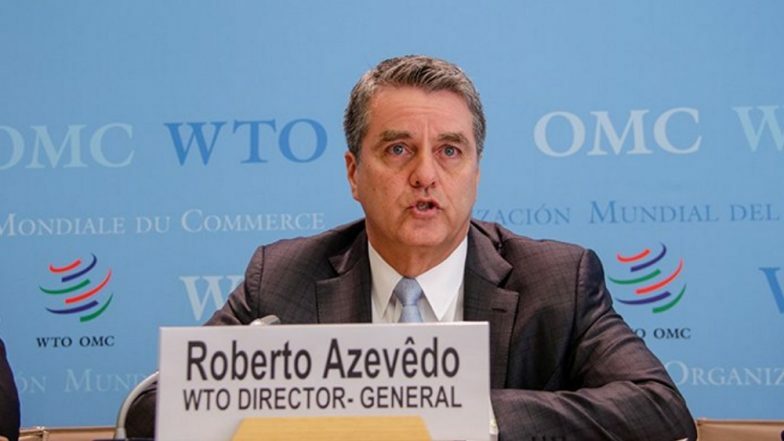 "The fact that we don't have great news today should surprise no one who has been reading the papers over the last 12 months," WTO director-general Roberto Azevêdo told reporters in Geneva. He added, “With trade tensions running high, no one should be surprised by this outlook. Trade cannot play its full role in driving growth when we see such high levels of uncertainty,” said Azevêdo. The WTO also cited “weaker global economic growth, volatility in financial markets and tighter monetary conditions in developed countries” as factors contributing to the trade slowdown. The 2.6% figure is the slowest growth forecast since 2016 but the director-general said a "relaxation" of tensions, especially the lifting of restrictive trade measures, could see 2019 beat the projections. The global trade growth forecast for 2020 is at 3%. He sounded a warning for countries employing protectionist measures, “If we forget the fundamental importance of the rules-based trading system we would risk weakening it, which would be a historic mistake with repercussions for jobs, growth and stability around the world,” Azevedo said.